In general coniferous plywood is slightly better deciduous as the interline interval, made, as a rule, has their wood of coniferous breeds of less defects; besides, thanks to presence of natural pitches wood of coniferous breeds possesses большей water resistance.Coniferous plywood the Given kind of plywood is made basically from a pine which properties provide not only an attractive and harmonious kind of a surface, but also excellent indicators of durability at low weight that is successfully used in housing construction (a covering of walls, a basis under floors, a covering of roofs, a construction of partitions in premises). The natural beauty of a structure and a wood colouring do coniferous plywood irreplaceable in furniture manufacture, interior and ex-terrier registration. Coniferous plywood possesses high firmness to rotting and infection with fungi. 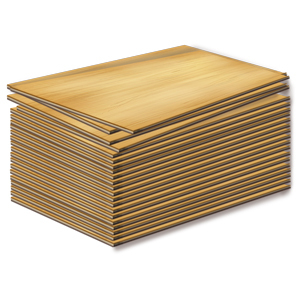 Coniferous plywood possesses such qualities because the needles are impregnated by pitches and have on a basis glue. Coniferous plywood is applied to roofing works. Coniferous plywood will serve all service life of a "soft" roof. 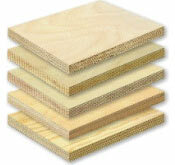 The basis glue, the raised moisture resistance of coniferous plywood, provide application for a long time. Coniferous plywood while in service changes the initial dimensions on a thickness to 0,03 %, on length and width on 0,02 %.